XML or Extensible Markup Language is one of the most common standards in which eBooks are available in today’s time. Although the eBook industry is still very young, it is predicted to expand in no time. Electronic readers are already multiplying in numbers with each passing day as the benefits linked to this way of reading far outweighs the tradition method of reading printed books. While the digital distribution of eBooks has no limits, traditional printed books face several limitations. Printed books are bulky and several of them cannot be carried at the same time. EBooks on the other hand are portable and a person can store multiple books in one device. As the digital distribution of eBooks has become the order of the day, several publishers and authors are facing challenges to meet the growing demands. Readers want eBooks but the multiple standards in which an eBook is available is throwing a big challenge in front of the publishers. For publishers, to convert their content into an eBook format may turn out to be a costly affair. Also, with more devices flooding the market, conversion into different standards could take a toll on publishers and authors. So, what is the solution?? An eBook reader such as the Amazon Kindle is one of the most popular eBook readers in the market. It is more popular because it does not limit the reader to a Kindle device. A Kindle format book can also be read on your desktop computer, netbook or laptop. So, the best solution for publishers and authors who want to multiply their eBook download is to convert their eBooks into a Kindle’s Mobipocket format of Mobi / prc. If you have filed in XML format then email us the file and we will quote you for it. 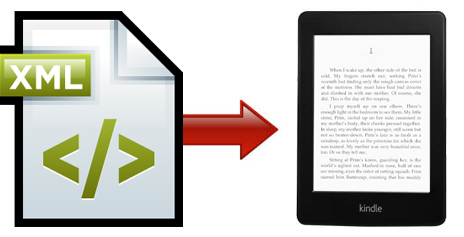 Hassle-free conversion: We manually convert the XML file to Kindle format for you. We take proper care with regards to the formatting of the file as well as meeting the Kindle conversion guidelines. Best Kindle conversion services: Since, we are the preferred vendor for Amazon’s Mobipocket file format; you rest assured of nothing but the best Kindle conversion services. Strong customer support services: We are at your beck and call and we mean it. Our customer support department is functional 24*7. So, if you have any ambiguity or doubts related to Kindle conversion, speak to us directly. At any stage of conversion, you can call us and clear your doubts. Guaranteed satisfaction: We send you the final output only when you are satisfied with the outcome. So, if you feel the need to make certain changes or update the file, feel free to communicate us. We have an extensive knowledge in the field of eBooks conversion and guaranteed lower conversion cost. We can help you convert from XML to Kindle without hassle. All you need to do is to email us the final unprotected XML *file at Bob@itglobalsolution.com and the rest will be taken care from our end. Our team will go through the file and let you know the total cost for converting into the Kindle format and the time required for conversion. After you are satisfied with our response, you will be required to make the payment. As soon as we receive the payment, we shall start the conversion process. Once your file is converted from XML to Kindle format, we will email it to you for your approval. You can check the converted Kindle file and let us know if there are any corrections. We will send you the final file that you can upload to your Kindle account. For further information on how we can help you to convert your XML file to Kindle, call Bob at Supremus Group at (515) 865-4591 or email your query at Bob@itglobalsolution.com. *We can receive books up to 15 MB. In case, the size of the book is larger than 15MB, send it through free service of www.yousendit.com OR upload it to our FTP server. Please contact us for a login and password.